It's Inch For The Win -- By a Mile! The newest Evotri teammate Matt Inch takes us through his first race representing the Evotri colors. He has a great finish and even better ending. Congrats Matt! Hearing your alarm go off at 6:15 on a Sunday morning is never the first thing you want to wake up to, but on race mornings its just something you have to deal with. I rolled out of bed and went to put in my contacts. “Man, I feel like a retired senior citizen this morning!” hobbling to the bathroom like a penguin, body aching from the culmination of the workouts throughout the week. Do I really have to race today? Typically on race day I am giddy with excitement, really chomping at the bit to get things started, but this morning was different. 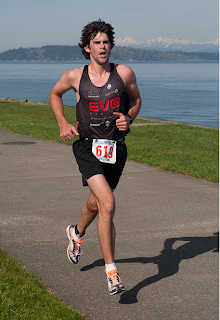 I had a 10k road race in beautiful Alki Beach in Seattle. It was a crystal clear day, and in the middle of April in Seattle that is a rarity, so I started to feel like the stars were aligning for me. The course was a pancake flat bike trail that runs right along the Puget sound, and on a clear day (which it was) you could see the Olympic mountain range nearly 100 miles away. It was a picture perfect day for a race. I decided to get in an extra long warm up in, nearly 5k, because I was so tight and sore from everything I had done throughout the week. Boy did that make me nervous. Shuffling along the outskirts of the course I thought to myself “I am in for a real treat here!” I felt as terrible as I did when I crawled out of bed. Near the end of the warm up things started to loosen up for me and I slowly became a little more optimistic with how things were going to play out. Got in a nice solid stretch session and put on my flats, and pulled out my brand new coveted Evotri jersey! I was so excited to put that thing on and get the first race in. My semi optimistic outlook on the race quickly skyrocketed off the charts when I pulled that thing out of my bag and put it on! The starter ushered us into the starting chute and we were underway. The last 10k I ran a month and change back didn't go so hot, I went in with the mentality that I was going to break everyone early and run away with the race. 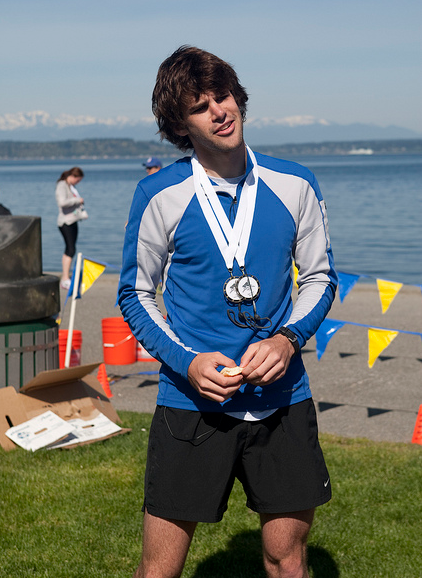 I went out in 5:10, cracked hard, and finished in a 36:35. I was disappointed, but for my first 10k ever it was a good starting benchmark. I came into today’s race with the mentality that I am going to take the first mile out very controlled, looking at about a 5:40 first mile and see how things go from there. I came through the first mile in 5:36 feeling unbelievable. 1 mile down 5 and change to go, and I don't even feel like the race has started yet! I kept pressing on, trying to focus on keeping my form together and the cadence up, maintaining that pace as long as I could. I came through mile 2 in 11:06…BAM!!! I was feeling great and couldn't believe it! I was starting to breath heavier now, but didn't feel that the pace was too taxing, so I kept on ticking along. The course was set up for a 5k, but the 10k runners were asked to do 2 loops of the course. So when I hit the turnaround I was sitting at 17:27, still feeling unbelievable. There were a couple 8 year old kids at the turnaround ushering me to the cones, and I gave them a few high 5s and a smile as I passed by…they loved it. At this point in the race I was all alone, and had at least a 90 second to 2 min lead. I kept my eyes on the road in front of me and told myself, maintain this pace till the turnaround, and at that point give it everything you got! I came through mile 4 starting to feel heavy, but mentally strong, knowing I had a great race going. All of my miles up to this point had been between 5:35 and 5:50, a very consistent and well executed race. I couldn't let this one slip away! When I hit that turnaround, I knew it was now or never. I made a quick glance at my watch and saw that breaking 35 was not out of the question, but it was going to take some serious work. I started to lengthen the stride a little bit, really using my upper body to pull me through this final stretch. Gutting out every stride, every deep breath, every pounding beat of my heart I made one last charge, with less than 400 meters to go I could see the finish line and knew that sub 35 was mine! As I was changing a few other racers came up to me congratulating me, and I shared the love back with them, asking them how their day went and if they were happy with it. Its humbling when you go to a local race like that, less than 100 people racing, and you are looked up to as a hero for being fast. It is very cool to see how excited they are to come up and talk to you and just have a normal conversation. Quite honestly though, at the end of the day, we are all the same. We all put in hours on top of hours of hard training, there is no external incentive for us. We do it because we love to. It is our passion. We share the same love for endurance sports. 99 times out of 100 the person who wins the race is going to be just like I am. An everyday individual just doing what he loves, and he would love to meet new people, hear exciting stories, peoples backgrounds etc. I challenge you to do that next time you are at a race. Whether you are in my shoes, or the person who wants to chat with the winner post-race. It's a very small world out there and you may just meet someone very interesting. One of the athletes that came up to me after the race was a younger guy, 20 I think, and his parents came up with him. His mom started to talk to me at first and then I realized that he was deaf. His name was Taylor, and we chatted for awhile and I found out that he was an avid Xterra triathlete and wanted to get into road triathlons and half irons. We chatted for well over a half hour about past races we had done, how we got into the sport. A very interesting and intriguing conversation that honestly could have gone on for days. Near the end of the conversation he thanked me repeatedly for talking to him and giving him some of my time to just chat. Again, I was truly humbled. This kid is over the moon excited to talk with me (an average every day guy, who works 45 hrs a week and fits in training in the small cracks of free time) when in all reality he is the one who is the true hero. As most of you know I have a blind friend, Aaron Scheidies, that I have been training and racing with for the past 4 years, who has really taught me a lot about life lessons and how to hold yourself in society. I have been very blessed with the relationships I have formed in my life and I am very excited to continue to get to know Taylor over the next couple months I am here in Seattle, and continue to stay in touch over the years. When I found out that Taylor moved to the town next door to where I live I asked him if he would be interested in training with me, and the look on his face was priceless. He had one of the biggest smiles I have ever seen in my life. That to me is far more rewarding than any trophy or medal I won at a race. To make a difference in a person’s life, and to show interest when the majority of others do not. To see the joy brought to their faces just from a short conversation. If I never won another race, but instead had the reputation of being the most friendly, motivating, inspirational athlete, local or nationwide, I would be a happy man! There's the plan. And then there's reality. The plan was wake up early, get a trail run in, and then a quick ride up another mountain and back to the house to pack up and go home. Again, that was the plan. The trail run went well. 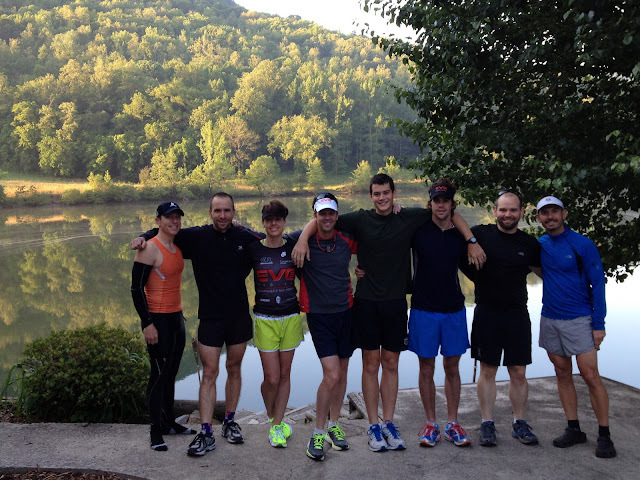 Everyone woke up, bright-eyed and bushy tailed, and ready for our HUB Endurance hosts, Andy, Anthony, and David to take us to the Cumberland Trail State Park. Up and down, in and out, over the hills and through the woods the trail wound. Everyone came home with rave reviews and a definite "must do again" attitude. Team Evotri and HUB Endurance ready to run. After the run, everyone ravenously enjoyed fresh pancakes and eggs, with some left over burgers, ham and cheese mixed in. A quick change and dip in the river for some, and onto the bikes for a quick up and down, be-back-in-two-hours kind of ride. Stu and Rob stayed behind to clean up the place and make sure that everything was good to go when everyone returned. After taking a bag of garbage to the dumpster, Rob got quite an evil eye from a woman who appeared to be cleaning the adjacent house. He went into the house and asked, "Stu, what time were we supposed to be out of here?" Just then the phone rang. "10 AM, apparently." (It was now 11:30.) "And the next people are going to be here at 3 PM." Eventually everyone else made it home safe. (We later found out that Anthony got a clean bill of health and all those broken bones were not broken at all!) After some quick changes and resorting of bags and it was time to say good-bye -- but not before making promises to return in 2013. Heather, Brad and everyone at Quintana Roo for showing us the place, the great lunch ride, photo session, and tech talk. We are excited, honored and proud to represent such an outstanding organization. Andy & Jamie at HUB Endurance for the classy happy hour, bike support, and guiding the team along the rides, runs and hotspots all weekend. Everyone, please consider reaching out to HUB for anything you might need, they won't disappoint. And finally, Chattanooga exceeded expectations from being Outside Magazine's Reader's Choice for Best Town. Consider it as a base for your next adventure. See you again for Camp Evotri 2013! After a successful first day in Chattanooga, Team Evotri was ready to take on some serious terrain. Most of Friday's HUB Happy Hour and dinner conversation surrounded about the next day's climbs. Friend of HUB David convinced the adventurous to tackle Roberts Mill Road (1,086 foot gain @ 12.1%) and the rest of us would tackle something a bit more on the sane side of things. Chris with an all-knowing smile, "Does JP know what he's in for?" Once again, the Tennessee River did not disappoint in the morning. It's one thing to be on vacation, and see the sun rise over the steady pulses of waves pound the shore. But, it's a whole other experience to watch steam rise from a mighty and powerful working river that has cut a path deep into Earth, leaving great hills to climb on bikes. Off we went as a team. The hearty would challenge Roberts Mill Road, of which only two souls in the history of bike riding have made it to the top in the big chain ring. Matt, JP, and Chris followed David up -- straight up -- while the rest of the team joined Anthony and Andy and followed the brave marching into battle. We got as far as the bottom, where it tips up at an unfathomable pitch. We offered some feeble words of encouragement and continued on to our climb. Onward we rode, until one final rest stop when Andy said it would be a right then a left and then up. One by one, we peeled off at our own pace. Rob burnt some matches early and was off the front but was quickly reeled in by Michelle, who increased her pace as she climbed and pushed on ahead towards the top. Stu kept his wheels spinning, sometimes singing a tune. Sara discovered two additional gears and made it to the top in style. The crew reconvened at the house and set off for some southern BBQ. Real honest-to-goodness BBQ, highly recommended by all the locals. You know it's good when from the outside it bears no resemblance to a restaurant whatsoever. But the R&R didn't last for very long. Trash talk between Team Michelle and Team Stu began early in the training camp preparation. With the river right out our back door, the afternoon swim was going to be a relay, a perfect venue for the Showdown. Four teammates crossed to the other side of the approximately 250m wide river while the other four stayed on the near shore. One length each for a nice workout. Michelle, JP, Sara, and Rob (Team Michelle) went up against Stu, Sarah, Chris, and Matt (Team Stu.) The battle was hot right from the get-go, with Stu setting the early pace and just out-distancing Michelle across the water. The river pulled Chris off course a bit, so JP made up the difference. The Sara(h)s matched paces and it was a dead heat between Matt & Rob on the final leg. Eager Inch took off like a shot, and wise-old Rob settled in behind for a draft. But the earlier hills did in the wise, but out-of-shape Rob and Matt prevailed to give Team Stu the inaugural victory. What weekend on the river wouldn't be complete without eating burgers from the grill, sipping on limoncello and other local drinks, and siting around a campfire and toasting S'Mores? We couldn't let the opportunity pass us by. Plus, there's Sasquatch to communicate with. Alas, all good things must come to an end and most of us were in bed early, resting up for our final day. 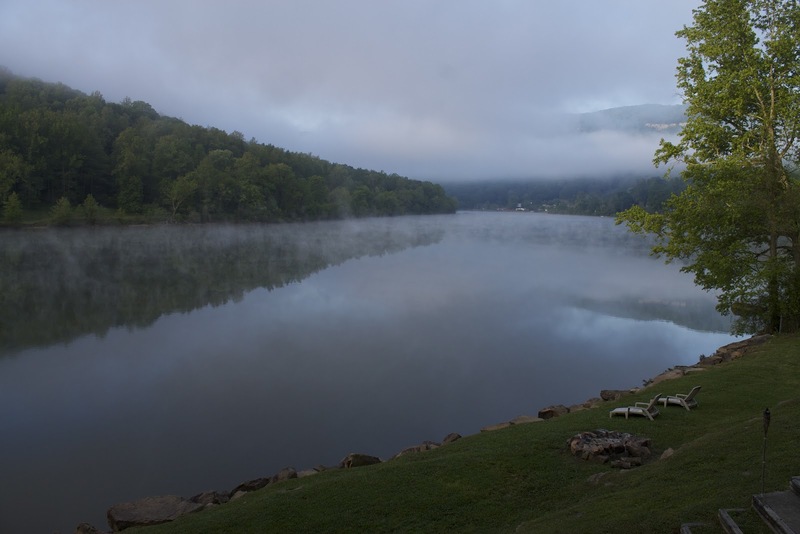 It was a calm Friday morning along the Tennessee River just outside of Chattanooga, TN. There was a quiet excitement in the house. Team Evotri arrived the evening before, keeping a promise to get together and train, trade stories, and take part in some tomfoolery. Morning chatter was brief as JP and Matt, fresh in from the west coast weren't yet used to the three-hour time shift. Others were giddy to see what was in store for the team and the weekend. Walking out the front door treated the team to quite the sight. Steam rose gently off the water as it wound through the valley floor. The sun was just hitting the tops of the surrounding mountains and cast a warm glow on our gorgeous nook. To keep things simple, our hosts from HUB Endurance led the team out to the road in front of the house, winding along the river, past farms, homes, and plenty of dogs. It was a great way to get the cobwebs out of the legs and prepare us for the rest of the weekend. Everyone regrouped after the hour-long jaunt and made our way to the home of Quintana Roo & Litespeed. Many thanks to our awesome hosts for the all-access factory tour following the cradle-to-delivery creation of a Litespeed titanium bike. 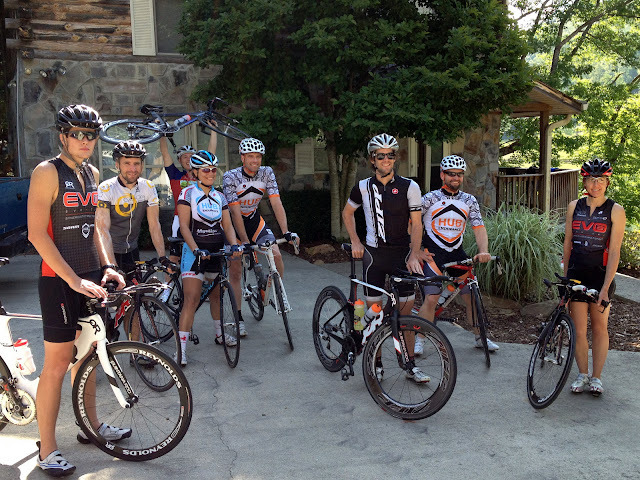 The Team took some time for a photo op, and then saddled up for a ride with a few folks from QR and their Friday Lunch Ride. Though we didn't get to the big hills, the rollers were enough to wet the whistle for the day. 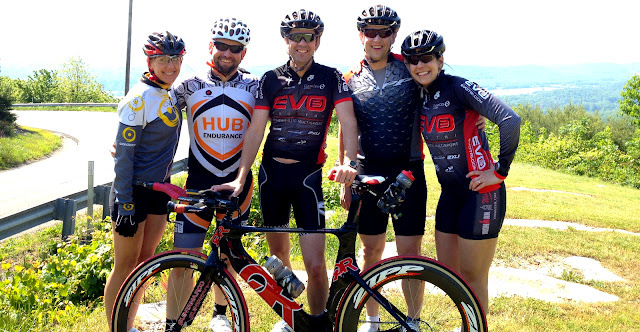 Our next stop was at HUB Endurance for their Friday Happy Hour. We were pleased to see ZIPP and SRAM reps there, showing off the new RED components, raising money for the World Bicycle Relief. We wrapped up Friday night with dinner and drinks in downtown Chattanooga and a little bit of ice cream for the walk home. Plans were made for Saturday's ride and the stage was set for Team Michelle vs. Team Stu. Come meet up with Team Evotri! 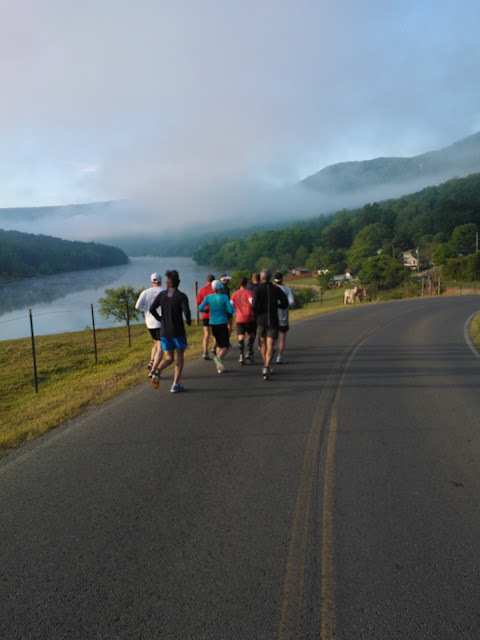 We are hosting a meet and greet & happy hour at HUB Endurance in downtown Chattanooga on Friday, April 13. Festivities will kick off around 5:30 PM and go for a few hours. Stop in; Say hello; Have a drink; and chat with some fellow tri geeks! My A race this year is the Ironman World Championship in Kona. I've got some demons to stare down there this year! My first time around was in 2010. I was 8 weeks off Ironman Lake Placid. Admittedly and retrospectively, I was shell-shocked. That place, plain and simply, freaked me out. Self-doubt crept in. 'Did I really deserve to be there? Could I handle another Ironman in 8 weeks? Everyone looks stronger than me. I got a roll-down slot.' The list of things that were running through my head were endless. And the result of this self-doubt showed in my performance. 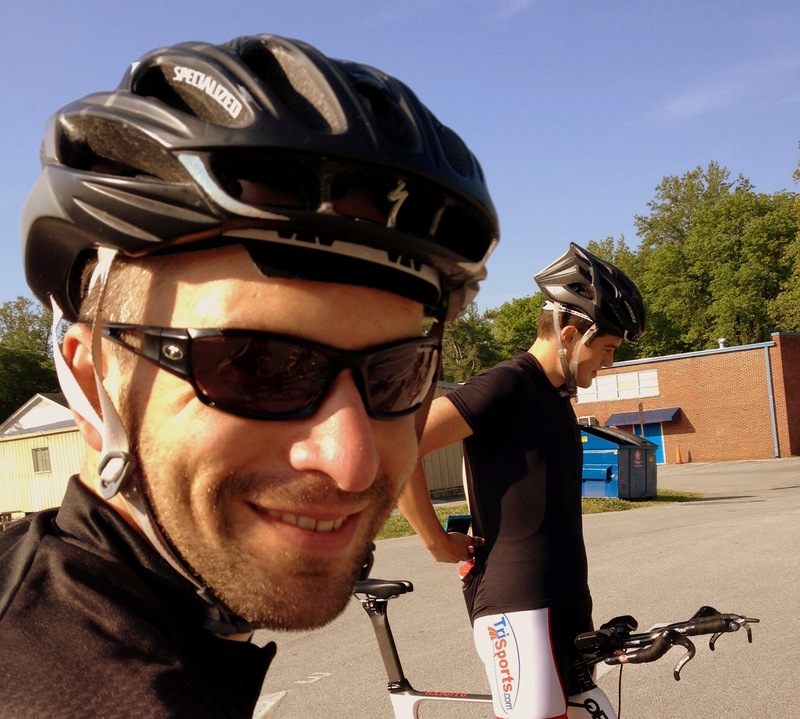 I fell apart on the bike and tried to tell myself it was OK because it was my first time there. And, yes, that was partly true but, no, it was NOT OK! So, how do I remedy this? Go back to the scene of the crime and put a new twist on the story. Focusing on the journey is one way to practice the Buddhist concept of mindfulness. In Buddhism mindfulness is part of the Noble Eightfold path that leads to enlightenment. The Roman poet, Horace, was also thinking along these same lines when he penned the Latin phrase: carpe diem. To swing the literary pendulum all the way to the other side, pulp western novelist Louis L'Amour once wrote: “The trail is the thing, not the end of the trail. Travel too fast, and you miss all you are traveling for.” 'Ols and Buddha, Horace and L'Amour- these guys are all on to something here. Running down the street, dusk. Street lights on. Feet on the pavement, hand on the iPod, breath in and out. Colder; more realistically March, actually. 30 short minutes is all I get today, but it is 30 minutes I wouldn't trade for the world. Thirty minutes to run it out, to remind me who I am, to come home better. Better everything. My shadows follow me with every street light. They start behind me, inch up in front of me, and then swishswishswish of the ponytail they pull ahead of me, reminding me of where I'm going. Where I'm heading.